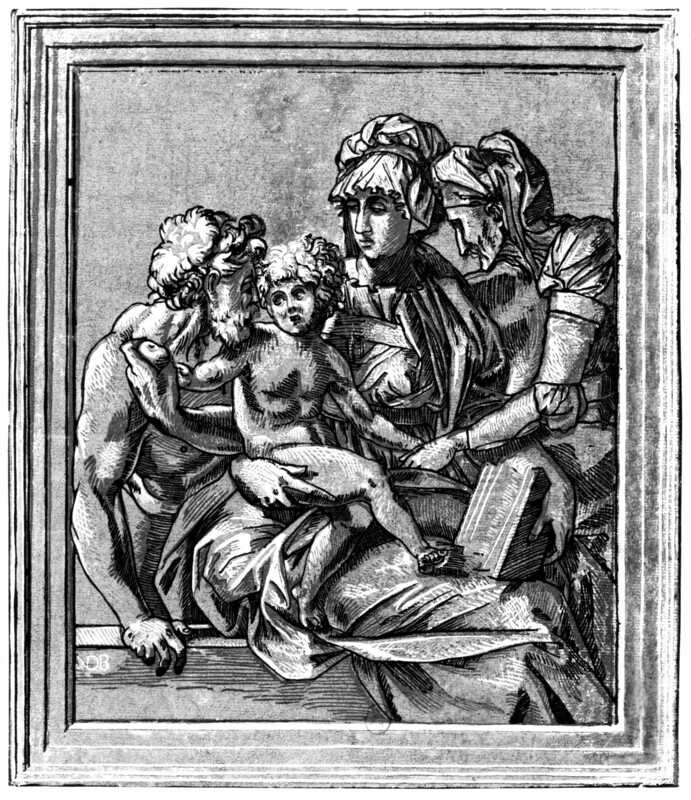 Chiaroscuro woodcut in three blocks by Master NDB, 27.7 x 23.3 S (Paris, Ea 26a Rés.). I. Inscribed twice at the lower left, in the lightest tone block, and below that in larger letters in the middle tone block: NDB. II. The inscription in the middle tone block has been removed. Bartsch, XII, 1811, 59-60, 17 (State II, as above), as after Rosso and after Boyvin’s engraving in reverse. 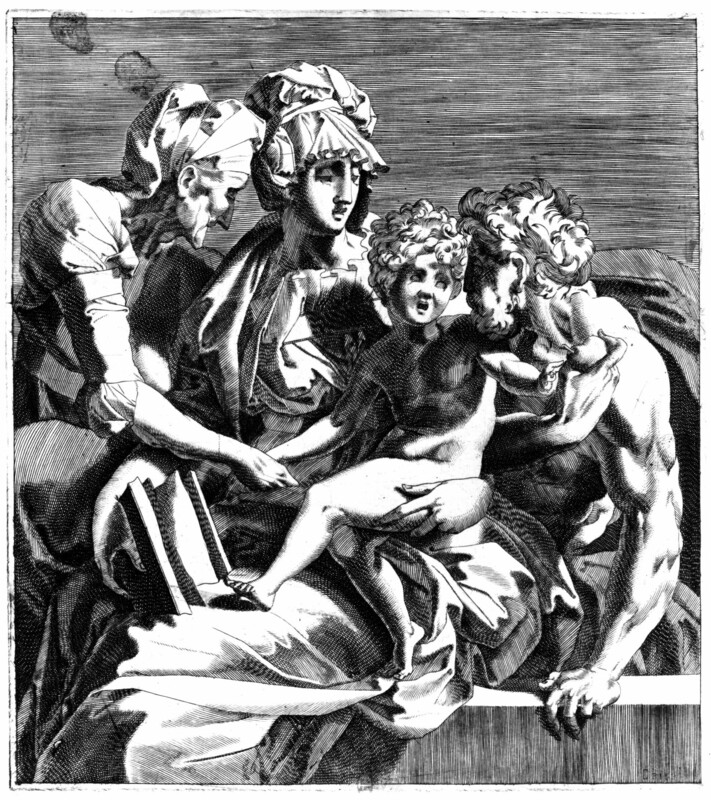 Bartsch, XII, 1920, 30-31, 17, as after Rosso, and of the same composition in reverse of an anonymous print believed to be by Domenico del Barbiere (see below). COLLECTIONS: London, 1874-8-8-186 (I, frame cut off and top corners rounded off; dark ochre, gray-brown, and black on cream paper). New York, 58.636 (II, frame partly cut off on all sides; tan, brown, and very dark brown on white paper). Paris, Ea 26a Rés., p.22 (II, with full frame; ochre, brown, and black on cream paper). Vienna, It.I. Sect. Bd 1, p.75 (II, frame cut off; ochre, light olive green, and black on white paper). OTHER IMPRESSIONS (uncertain of status as original print but probably all original, State II): New York, 28.15.11 (with most of frame cut off). Paris, Ba 12, p.7 (frame cut off; tan, brown, and very dark brown on light tan paper). Vienna, It.I. Sect. Bd 1, p.75, second impression (frame cut off; gray-green, gray, and black on white paper); H.B.IV, Suppl. (Works after Rosso), p.68 (frame cut off and the N of the inscription; russet, brown, and black on cream paper). Nagler, Monogrammisten, IV, 1864, 744, no. 2372, 2. Weigel, 1865, 656, no. 7732, as depicting St. Elizabeth. Kusenberg, 1931, 167, as related to Rosso’s drawing in Milan. Karpinski, IB, 1, 1971, and IB, 48, 1983, 78 (New York, 58.6.36). Karpinski, 1976, 23-25, no. 3, Fig. (Paris, Ea 26a Rés. 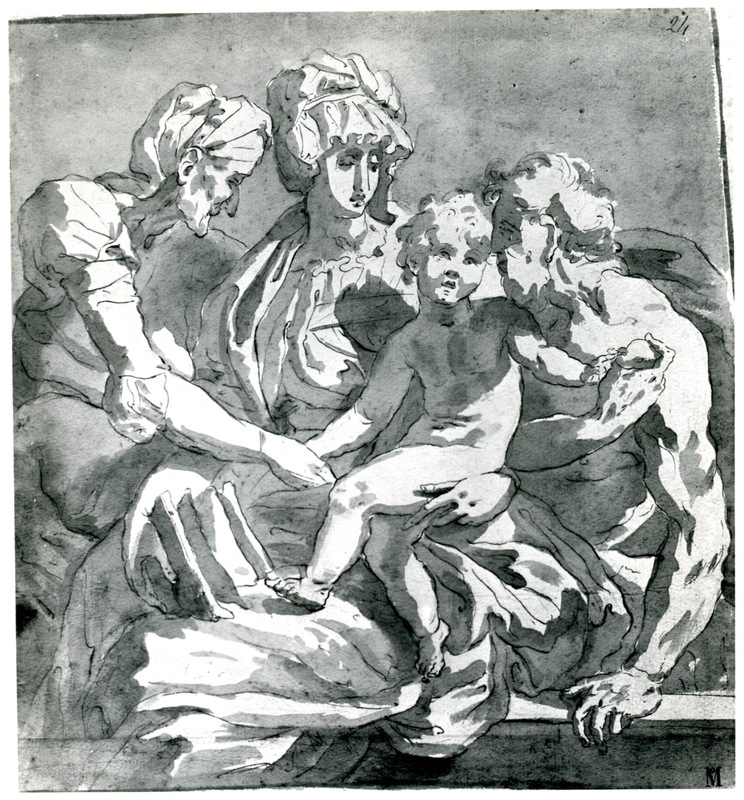 ), as by Master N.D. of Bologna after Rosso’s drawing in Milan. Borea, 1980, 263, no. 677 (London, 1874-8-8-186). Carroll, 1987, 46, 358-359, no. 113, with Fig. (Paris, Ea 26a Rés., p.22, reproduced without printed frame). 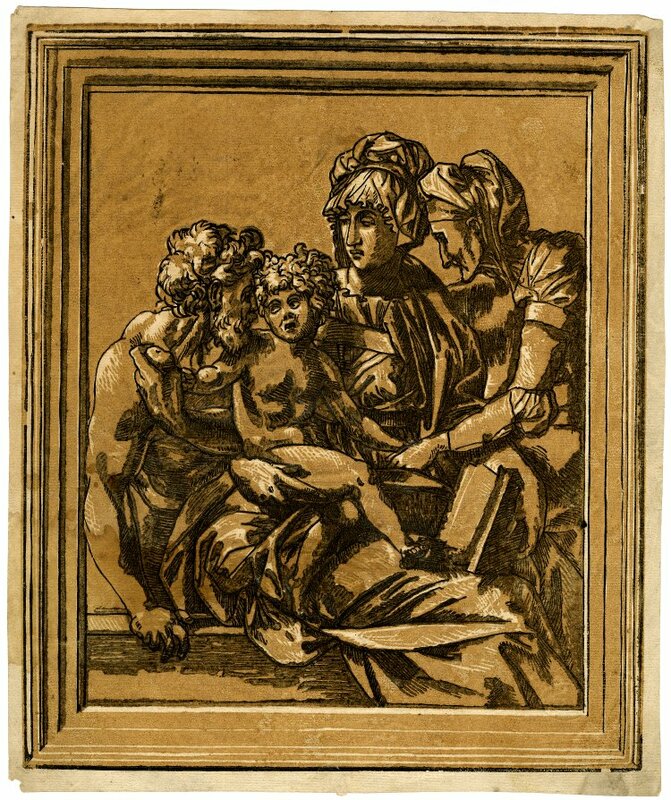 This print is related to the copy of a lost drawing by Rosso in Milan, but it is in reverse of it. For the differences between them and its relation to the anonymous engraving of the same composition (Fig.E.161), see under D.82 (Fig.D.82). 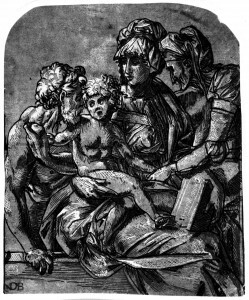 Like the engraving, the woodcut would seem to have been derived from Rosso’s lost drawing; it is not based on the copy in Milan. COPY, PRINT: E.162 (Fig.E.162). 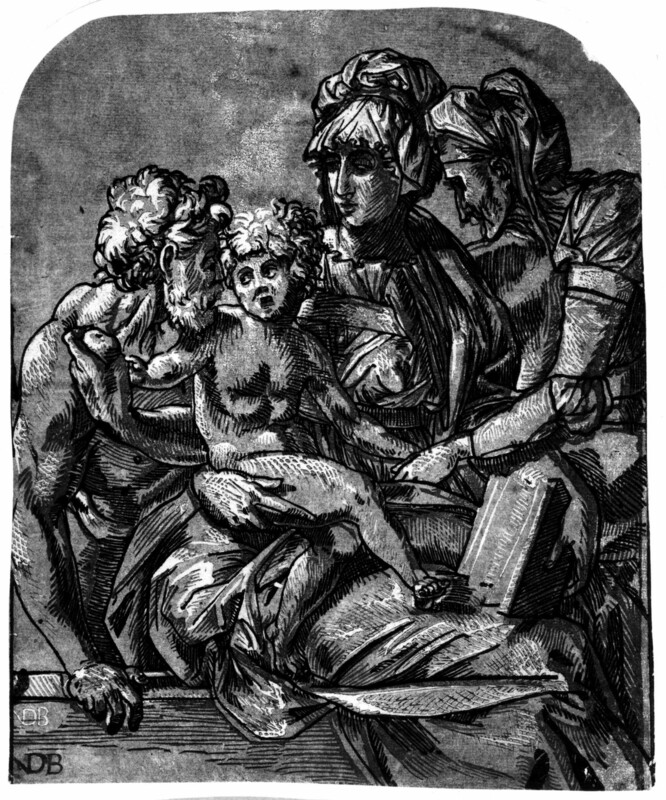 Anonymous, chiaroscuro woodcut, with frame but without the inscriptions. COLLECTION: London, W4-27, Case 55, Vol. 7 (with frame, 28.3 x 23.5; picture area 23.2 x 18.8; ochre, gray-brown, and black on cream paper). The following impressions may be of the same uninscribed copy: Chatsworth, Vol. IV, p.23, no. 32 (without frame, 23.5 x 19.1 S; two blocks only, olive green and black on light tan paper). Vienna, It.II., p.71 (with frame, 28.1 x 23.5 S; ochre, very light olive green, and black on white paper). LITERATURE: Carroll, 1987, 358, n. 1, under no. 113. The more regular cutting of the blocks of this woodcut suggest that it is a copy of the other print.